Do you have a hotspot in your plant that is undetected? 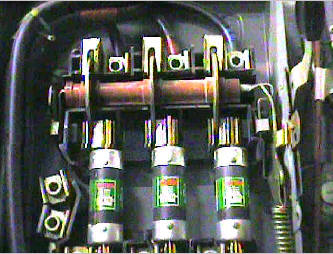 Many electrical system components with loose connections or equipment with defects are not visible to the naked eye. These items will eventually burn and fail – causing down time or maybe even a fire! 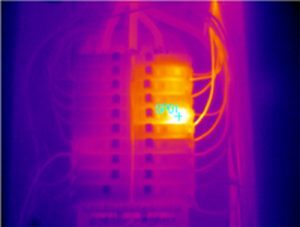 Using infrared thermography or thermal imaging, Muth Electric can help you find those trouble spots before they cause major issues with your systems. 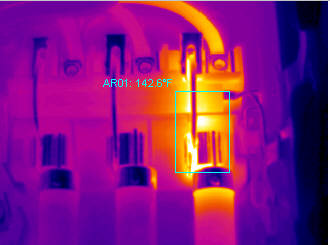 We have a thermal scanning camera and can take pictures of any electrical systems or mechanical equipment in your facility to find potential hotspots. By finding them early, you can plan your shutdown and avoid costly downtime for your equipment and your plant. The image below on the left is a standard color photo. The image in the middle is a THERMOGRAPHY IMAGE. It is generated by the thermal camera’s infrared ability to sense the difference in temperatures between a piece of equipment and its surrounding (ambient) temperature. The two images are taken simultaneously. In the picture, the far right fuse holder and disconnect blade look normal to the naked eye. However the THERMOGRAPHY IMAGE shows the same area to be at 142.6° Fahrenheit. Based on field experience of trained thermographers, any rise in temperature of 36 degrees or more (over ambient) indicates a fault that should have corrective measures performed as soon as possible (depending on the critical nature of the equipment). A rise of 54 degrees or more indicates a major fault that requires immediate attention. The example below represents a temperature rise of more than 70 degrees! Mechanical equipment such as pumps, motors, conveyors, process valves, storage tanks and HVAC equipment including their bearings, belts and windings are just as critical to image for problems. Costly downtime at a critical point can be averted with these systems also. After we perform a THERMOGRAPHY SURVEY, you are provided a detailed printed report of what we find showing any trouble spots, action required to repair the problem and its severity, and a cost summary to repair the problem. These reports can be used by maintenance personnel, safety officers or submitted to your insurance carrier. If you would like more information on the THERMOGRAPHY SURVEY process, please call one of our offices nearest you, or contact Rick Schaff in our Sioux Falls office at (605) 338-6586 or email him at rschaff@muthelectric.com.